Hey, uh, let’s all be real cool for a second. 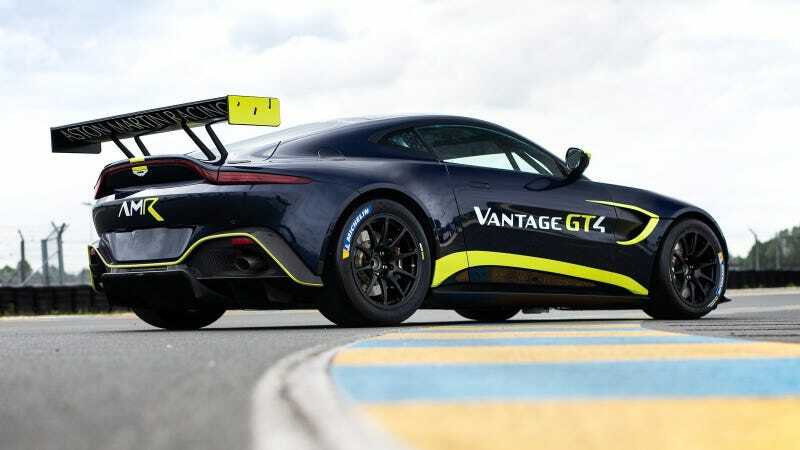 Nobody is going to arrest me if I get this new Aston Martin Vantage GT4 race car, revealed today ahead of the 24 Hours of Le Mans, and just drive it around, are they? I mean, all of the ordinary lights look like they’re still there. It’s probably not even all that loud, given that its 4.0-liter V8 gets quieted down by twin turbos. I mean, maybe it’s a little loud. But it can’t be louder than, like, a 1998 Plymouth Voyager with a major exhaust leak. I’m sure this thing could pass inspection. Probably. There’s probably some issues about it not being technically a road-legal car meant for road use, but that’s not anything we need to share with the nice people at the DMV, is it? They’re very busy. No need to trouble them about VINs and things. More importantly, it weighs a spare 2,744 pounds dry, according to Aston Martin, and makes a “boost-variable” 535 horsepower and 516 lb-ft of torque. There’s also a full cage, four-way adjustable Öhlins shocks and a six-speed sequential from Xtrac. You need a sequential on the street, right?